This colorful picture book is custom printed with a child's name and personal details. Want to help a child get caught up in a good book? Then try sharing one where kids can find themselves on every page! This imaginative picture book is not only full of fun, colorful illustration and high-flying fun, but the text is custom printed with details about your child. With 32 full-color pages, the story celebrates your child's life in cheerful rhyming text, and not only mentions their name and birthdate, but also their friends and grandparent, favorite places to go and more. 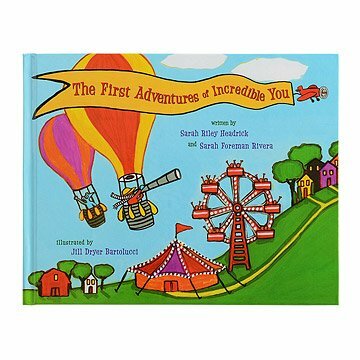 The book is the inspired creation of Sarah Headrick and Sarah Rivera, two mothers with years of experience picking out gifts for kids. Illustrator Jill Bartolucci is a self-proclaimed urban folk artist, and her whimsical pictures are full of the wonder of childhood. Printed in Olathe, KS. Better quality than similar personalized books we have ordered through the years for other grandchildren. Excellent gift for a special child in your life! Process was easy and you had the opportunity to check entries a couple of times to ensure accuracy. Book is colorful and great for entertaining a young child! Lovely child's book. Great keepsake. MOST AWESOME PERSONALIZED BOOK EVER! This book is very personalized and written extremely well....I was in tears by the end of the book. It is long, but very good. Very happy with purchase. I have purchased three other personalized books from this website and this one is by far the best. So glad I found it! There is no greater joy than a child climbing on your lap and asking you to read their story! I bought this for my nephew for his first birthday. We have made a traditional of getting him a book and I wanted to get him something special to mark his first birthday. I loved that I could customize this to be about him when it arrived I loved the bright illustrations and it was exactly what I was looking for. I only wish that you could choose to add in additional parts to the story, even if you were charged a small fee for the additions. We have a large family so I was forced to leave out people that I wished I could have included. Otherwise, the delivery was fast and the book was perfect! This special personalized book will be in our family for years. Highly recommend. Bought as a present for my son, he's enjoyed reading it. Glossy pages that are easy to turn. Names and places make it a personalized fun read and it rhymes, always a win.